I was excited to get my review copy of Matt Armendariz’s new book On a Stick! , featuring his fun recipes, gorgeous photos, and creative food styling by his uber-talented hubby Adam Pearson. 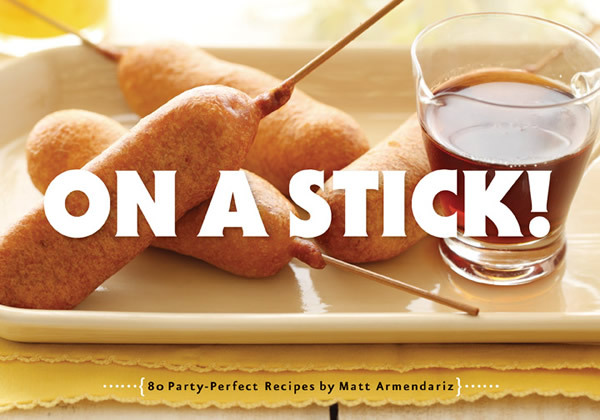 The book features 80 recipes, both savory and sweet, for fun party food and sweet treats. I made a vegan version of Matt’s fabulous recipe for Bo La Lot and it was truly delicious. I loved the full color photos of each and every recipe, which gave me tons of ideas for my next party. While lots of recipes are not vegetarian, and I don’t do deep fried food, there was plenty for me to consider making. Most recipes also include special sauces, and I’m always up for a good dipping sauce recipe. I realized that I only had one lonely appetizer recipe on this blog to date, so this was a perfect time to try something out. I was intrigued by a recipe called Bo La Lot, a Vietnamese grilled appetizer made from seasoned ground beef wrapped in an exotic betel leaf. 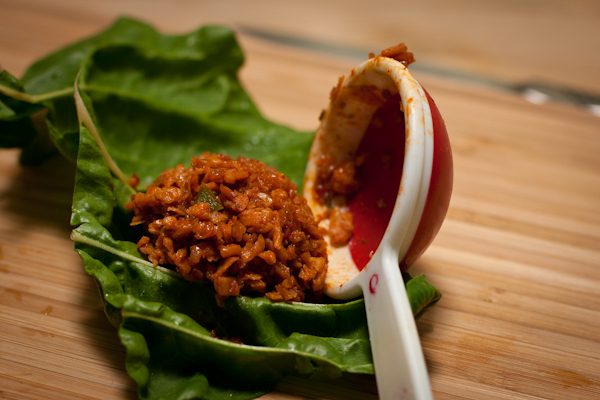 Read this post from The Ravenous Couple for a wonderful history of the meaning behind this dish. An email to one of my local blogger friends, Marie of Meandering Eats, sent me off to a new neighborhood to check out some Asian markets in search of this key ingredient. After trying three markets, I gave up on finding betel leaves fresh or frozen, but did come home with Chinese five-spice powder, galangal (a root similar to ginger), infant bok choy, a purple basily-minty herb to try out, and a delicious glutinous rice snack steamed inside a banana leaf. Score! The renovation: I decided to make the dish with Swiss chard leaves, which would be easy for you to find. You can also use sesame leaves (shiso); Matt recommends large spinach or grape leaves. I used TVP instead of beef, substituted agave syrup for the palm sugar, and added smoked paprika to help create the meaty taste. While I wouldn’t say this tastes like beef, I do think you could pass this off as minced pork and no one would ever know. The Husband and I devoured these as soon as the photos were done! If you are using bamboo skewers, cover them in filtered water while you work. 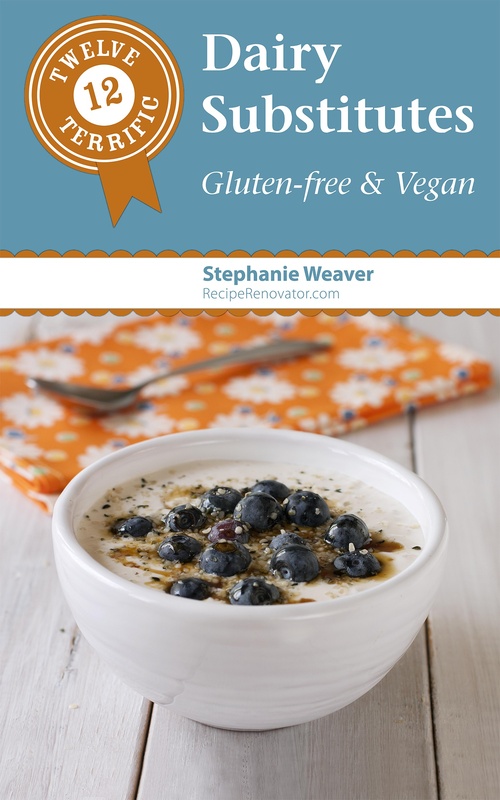 * If you are gluten-free, make sure you get TVP (TSP) that’s made only from soy, and only buy five-spice powder if you can read all the ingredients on the label. Some have salt and MSG in them. 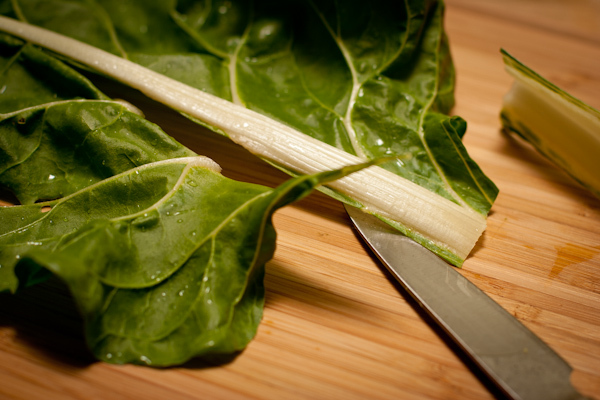 Wash the chard leaves, shake them dry, and prep them by cutting off the stem at the base of the leaf, then cut each side of the leaf off on either side of the rib. My pieces were about 3″ X 8 ” (8 cm X 20 cm). Heat 1 C. (250 ml) of filtered water to nearly boiling. Pour over the TVP and let sit while you prep all the spices. Peel the garlic and shallot and remove the hard end. Mince into very fine pieces. Peel the outer skin off the ginger root and mince as well. Remove any hard or papery leaves from the lemongrass, then pound with a mallet (I used the bottom of my ice cream scoop). This softens the fibers and brings out the flavor of the lemongrass. Mince the lemongrass into the smallest pieces you can. Cut off the top of the jalapeno, slice it in half lengthwise, then remove the inner ribs and seeds. Mince finely. Put 1 T. of grapeseed oil in a saute pan and heat on medium-high heat. Add the garlic, shallots, lemongrass, and ginger and cook, stirring, about 3 minutes. Add jalapeno, TVP, smoked paprika, five-spice powder, agave syrup, and vegan fish sauce, stirring to mix everything thoroughly. Cook about 5-7 minutes, until all the flavors have melded. Taste to see if it needs any additional seasoning. Preheat grill pan, grill, or Foreman grill to medium-high and brush it with grapeseed oil. Lay the chard leaves curly side up and place 2 T. of the mixture close to one end. Roll up tightly and set aside. Place four rolls next to each other and run a pair of skewers through them. Spray both sides of the bundle with cooking spray, and lay on the grill. Cook five minutes per side (5 minutes total if using a Foreman grill with the lid closed). 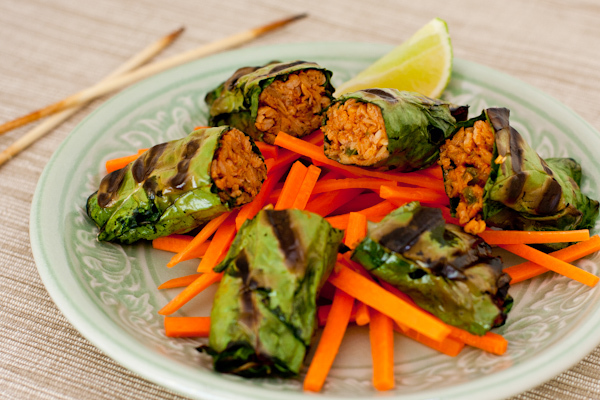 If serving as part of a meal, provide 3 rolls per person and serve with lime juice and shredded carrots. You can also cut them in half and serve with toothpicks, making 24 bites. If I were doing these for a party, I would double the recipe, have them rolled and ready in the fridge, grill just as guests are arriving, then cut each in half and serve with toothpicks. Many thanks to Quirk Books for providing me this free review copy. I look forward to trying more of Matt’s delicious recipes. This was so good when you brought it to the Kale-a-palooza party! I loved it! Hah, I like the substitution using swiss chard. Maybe using kale would have a stronger kick to it? That said, la lot (related to but not betel leaf) has an amazing smell and I hope you’ll find it eventually. 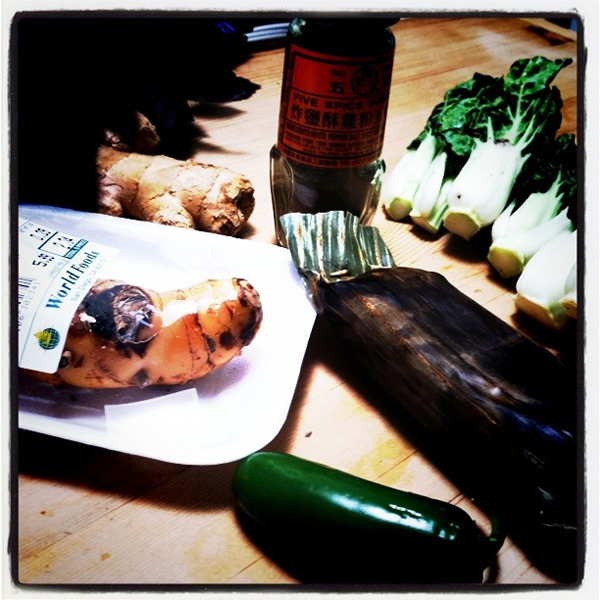 Have you tried Vietnamese markets specifically to get a full selection of herbs? Not all Asian markets are alike in their offerings, and markets that cater to Vietnamese tend to have to pay more attention to their herbs offerings. You can sometimes tell Vietnamese markets from all the other Asian ones by the prominence on the marquee and signs of Latin letters w/ many diacritical marks. Just looking at Google, looks like Thuáº­n PhÃ¡t might be one. I think kale would also be great. I happen to have a ton of Swiss chard growing, with huge leaves, so that’s what I tried. I am so curious to try it with the correct leaf, so I know what it’s supposed to taste like. Wow, thanks for all the info. I took the book with the photo to the stores. One store said they do carry it, but not now. The friend sent me to markets catering to Vietnamese food, as she knew what I was making. That said, I’ll have to check out the one you noted. Thanks! Wow, look at those professional grill marks! So pretty! You go, grill! This recipe sounds absolutely delicious and the photo is fantastic. Thanks Nancy! Matt’s original recipe (and photo) just looked so tasty I had to give it a whirl. So glad I did.